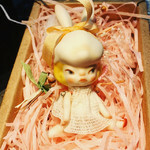 I got my new Moonglass doll from Marmite Sue! In fact it is an extremely high quality, extra white, extra translucent porcelain, as it is very pure in form. It is the purity that allows the formation of very perfect crystals in firing and therefore stronger than any other porcelain on the market. One more important difference between my porcelain and other porcelain, is that unlike regular porcelain (or resin in fact) moonglass can be mended. Therefore, In the worse case of breakage it can be re-fired and mended as if it was never broken, no scar or fragility remains. And this is why I can offer free repair work on all moonglass dolls, as it is simple to do, and does not require me to make new parts from scratch. 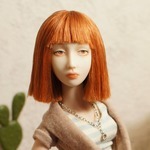 This doll is elastic strung- and her posing is surprisingly good. Much better than porcelain posing, and pretty good even compared to resin (see posing pix below). Any critiques? I would say that the wrist joint could use some improvement (aesthetically, maybe a ball joint would look better) and the knee cap seems a bit too small when sitting. However, that is really a stretch as all knee joints (and joints in general) are always going to be weird with jointed dolls. Overall the doll definitely exceeds my expectations. I highly recommend this doll! Of course, Eli is so back-ordered that her pre-order list (if it is even still open) is backlogged for at least a year a this point... but her dolls are very much worth the wait! I don't want to compete with any more people for the dolls, but I will tell you personally that I would recommend getting one of these dolls before they become unreachable like Marina's. The way Eli packages her dolls really can't be beat- talk about presentation! I also absolutely adore the way that Eli paints her dolls, the eyes are so soulful and her FEET are so ridiculously detailed- down to the blue veins in her delicate feet. Really remarkable painting on a doll so small. I also love the undertones- she relly looks like a painting from top to bottom. I love that the blushing is baked on so it doesn't flake off like with a resin doll. Such a gorgeous meloncholy little fairy! This doll is strung with elastic- so she doesn't pose nearly as well as Eli's spring loaded dolls Nevertheless - even with elastic she is strung very well and poses quite nicely- MUCH better than any porcelain doll I have, almost as good (but not quite) as a very tightly strung/high end resin like Enchanted Doll, Popovy or Tender Creations (see below). She passes all of the pose tests for me- she can touch her face- keep a pose with her arms, hands or legs without propping, can cross her legs, and is tight without being "kicky." The spring system can be purchased for $600 more or so (maybe depends on the doll). It seems expensive but is really is an effort to install from what I understand. Even though I went with elastic this time- I do recommend the steel/spring joint system if you can afford it because it will not fail you many years down the road- and the posing is superior. Her head seems smaller than my resin Marmite Sue dolls - so I think there is a little bit of shrinkage with the porcelain. 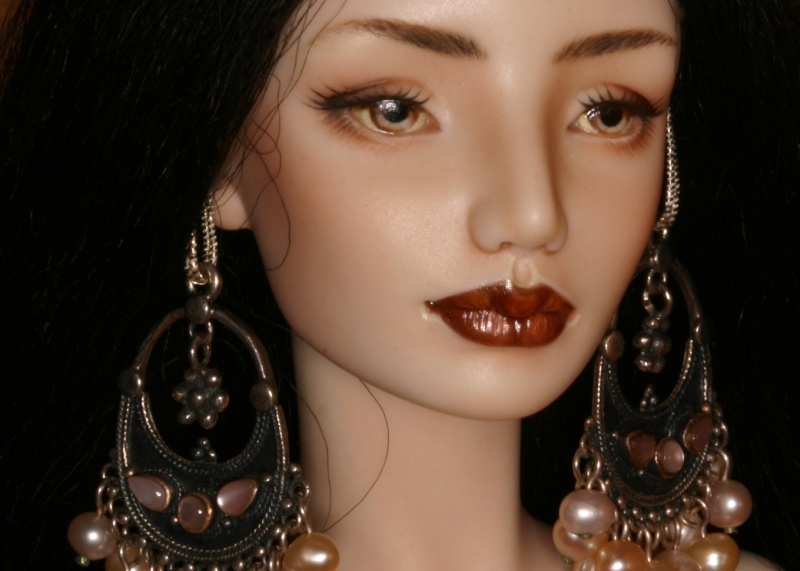 She can wear wigs made for Tender Creations and Sybarite- but not Kingdom Doll or Popovy. She is very slender so she could wear a skirt designed for fashion royalty if she wanted (waist is about the same). Some tops might fit as well. great pics and summary .. thanks! Aw wow! Super pictures!! Thank you for sharing them! Your new girl is very very beautiful! Thank you for taking the time to post comparison photos. Oh comparison photos, awesome!! She looks like a good fit with either ED or Popovy in terms of scale. She is so pretty!!! Your girl is absolutely breathtaking! She does pose nicely, very elegantly actually especially the way she crosses her legs. she's very pretty and her body is beautifully painted too. UPDATE: So I was incorrect to think that the Moonglass had resin in it- Eli has advised that the material is in fact incredibly high quality, extra-translucent, pure porcelain. So Moonglass is in fact a type of porcelain, not resin/ceramic/mix.